Ayurveda is Indian traditional medical science. It embraces all aspects of human being, in order to bring a complete state of well-being. 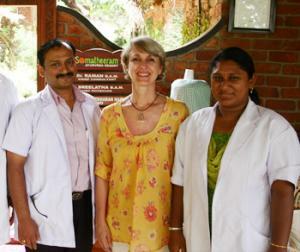 Ayurveda has been Indian traditional health care system for thousands years. It is a complete system, considering lifestyle, nutrition, herbal remedies, cleansing practicves and massage to promote physical, emotional and mental health. The Ayurvedic approach involves all aspects of life, by considering the relation between the individual and the environment he lives in, according to season change. Ayurveda ultimate purpose is to achieve a life of harmony, health, prevention and quick healing from disease. Ayurveda means "Science of Life". It is a Sanskrit word consisting of roots Ayus "life" and Vid "knowledge." Ayus is the daily life cycle representing the body, senses, mind and soul. Vid is the knowledge of the world and everything within it, both inside and outside the individual. Ayurveda is a rational system explaining human body functions and how the individual interacts with the environment, what turns him away from health and balance, what helps him stay healthy and achieve longevity. Ayurveda is a combination of science and philosophy, both necessary for body and mind complete health. Physical, mental, emotional and spiritual needs are addressed with commitment and seriousness. According to tradition, Ayurveda was conceived after the revelation of Brahma, creator of the Universe. There is a close connection between medical knowledge and religious and philosophical thought permeating all Ayurvedic texts. Ayurveda is true knowledge: it is not based on ever changing research data, but on universal laws considered immutable, valid and reliable since thousands of years - laws that today are being confirmed by official medical science. The Ayurvedic medical knowledge takes origin from a combination of divine revelation and the memories of ancient sadhus teachings. The Indian tradition recalls that thousands years ago the wise men - called "rishis", those who see - became very concerned about the suffering of humanity. They noticed that health problems and the shortness of life left little space for personal growth and spiritual development. Fifty-two rishi reunited at the foothills of Himalaya to learn how to free the world from suffering and illness. They reached a highest level of knowledge through the practice of collective meditation and inner vision, deciding to write this knowledge in books that became the basics of Ayurvedic medical philosophy: the Charaka Samhita about general medicine, written by Charaka, divinely inspired by Atreya; Sushruta Samhita, the theory and practice of surgery, written by Sushruta and inspired by Dhanvantari. Three particular aspects of knowledge were inquired: etiology, that studies the causes of disease, symptomatology, interpreting and classifying the symptoms, and medication, including herbal remedies and healthy practices. Originally, there were three main medical branches : Medicine, Surgery, Gynaecology. Five more branches developed later on, for a total of 8: ear, nose and throat disorders, Toxicology, Pediatrics, Science of Rejuvenation, Psychiatry. The eight branches generate the great tree of life. Ayurvedic doctors study nutrition, herbal medicine, climatology, crystals healing powers and astrology. Ayurveda teaches that every disease reflects both in the body and the soul, and they are not to consider separated. It recognizes the uniqueness of each person or patient through its "constitution", which determines the state of health and the tendency toward certain diseases and imbalances. Dealing with most disorders, Ayurveda considers the influence of dietary, environmental and psychosomatic factors that disrupt the balance of the constitution. This is how wellness is preserved and how physical, intellectual and spiritual qualities are improved to facilitate the healing process. There are endless types of Ayurvedic massage. Just think about how ancient this practice is, thousands of years, and the place it developed: India, a continent so vast, stretching from the snowy peaks of Himalaya to the scorching heat of the tropics. For these reasons it evolved in many different techniques. Many years ago I lived in India and studied Ayurvedic massage, a technique called Ayurveda Healing Massage. As in most traditional Indian stories, I was chosen by ab old teacher who directly transmitted me his knowledge, along with the duty of teaching it in the West. Now it is called Ayurvedic Touch® and it may seem a simple and pleasant massage. Truth is, it is an experience of deep transformation; just try and you will know!